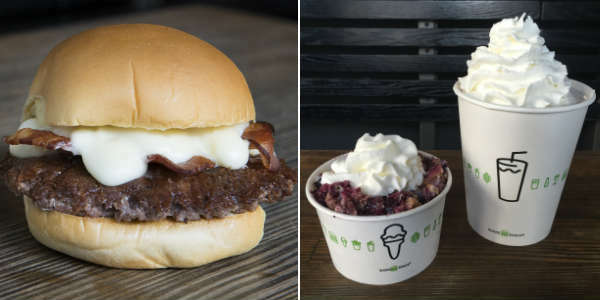 Shake Shack is adding two new items to its menu starting June 3. The first is the Bacon CheddarShack Burger. a all natural Angus beef hamburger topped with smoked Niman Ranch bacon and Wisconsin aged cheddar cheese sauce. A single will price at $6.89 and a double will be $9.69. Enjoy a traditional Thanksgiving dinner with a side of rodizio-style southern barbeque at this restaurant, which is a favorite of ours. Among the meat selections: mahogany-glazed turkey drumsticks, cider-brined turkey breast, and chipotle pumpkin chorizo. The meal also includes their famous all-you-can-eat buffet served from the back of a cherry red classic ‘51 Ford F1 pickup truck. The Thanksgiving Flatbed Buffet is available from 12pm-8pm on Thanksgiving and 5pm-10pm Friday-Sunday. Free valet and self parking. Click here for a full menu. For reservations call 407-827-3080. 1905 Hotel Plaza Boulevard, Lake Buena Vista, FL. Read our review here. $34.95 per person; $10 for children under 7. Offering a traditional Thanksgiving dinner with all the fixin’s and dessert, starting at 5pm. Live music by the B.B. King All-Star Band. For reservations call 407-370-4550. 9101 International Drive, Suite 2230, Orlando, FL. All locations in Central Florida are offering the Decadent Turducken Burger for those not wanting a traditional Thanksgiving meal. This “burger” features a hand-formed turkey burger stuffed with a blend of rosemary chicken inside of duck patty, topped with melted Brie and homemade cherry, cranberry and red apple chutney. 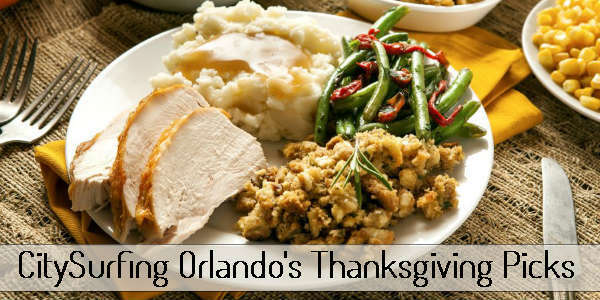 Located on Orlando’s restaurant row in Dr. Phillips, this steak and seafood restaurant will be offering their full a la carte menu as well as a traditional Thanksgiving dinner of sliced turkey, green beans with bacon, brioche stuffing, glazed acorn squash, cranberry sauce, and mashed potatoes from 11am to 9pm. There will also be special pricing on Roederer champagnes. Free valet parking. For reservations call 407-355-3011. 7488 W. Sand Lake Road, Orlando, FL. $32 per person; $15 for children under 14.